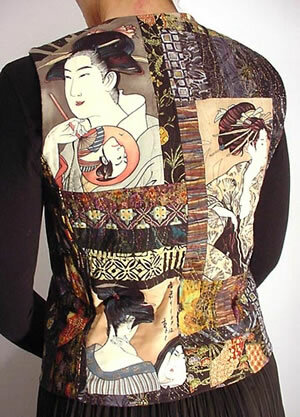 The inspiration for this piece was a Japanese geisha "portrait" print fabric I picked up in New York City's garment district (Robert Kaufman). I was spurred to action by a challenge in the Spring 2003 issue of Quilting Arts magazine. This piece was constructed entirely of fabrics from my stash, with a goal of creating something truly wearable. 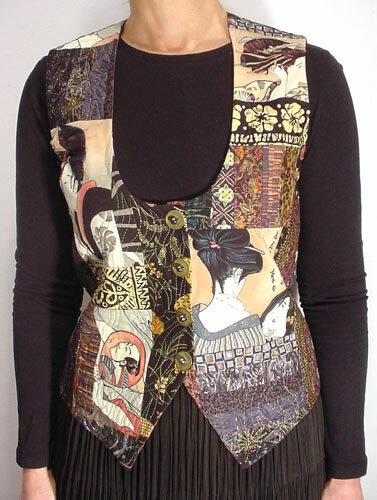 This is my first attempt at a pieced, quilted, and embellished garment.